Angry customers threw eggs at Apple’s flagship Beijing store today after its opening for the Chinese launch of the iPhone 4S was cancelled due to concerns over the size of the crowd. Apple reacted to the scuffle by postponing iPhone 4S sales in its mainland China stores to protect the safety of customers and employees. It said the phone will still be sold online and through its local carrier. 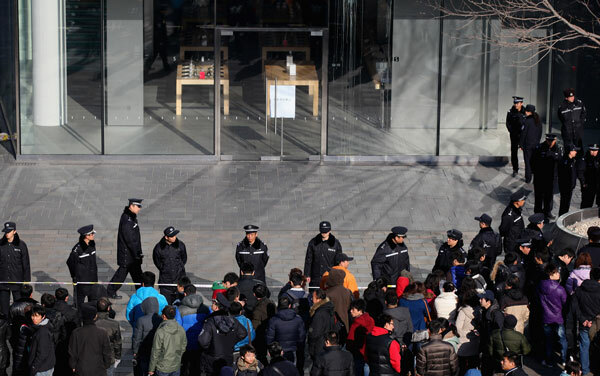 Customers including migrant workers hired by touts in teams of 20 to 30 to buy iPhones for resale at a mark-up to Chinese gadget fans waited overnight in freezing weather at the Apple store in Beijing’s eastern Sanlitun district. The crowd grew angry after the store failed to open on schedule at 7am. Some threw eggs and shouted at employees through the windows. A person with a megaphone announced the sale was cancelled. Police ordered the crowd to leave and sealed off the area with yellow tape. Employees posted a sign saying the iPhone 4S was out of stock. “We were unable to open our store at Sanlitun due to the large crowd and, to ensure the safety of our customers and employees, iPhone will not be available in our retail stores in Beijing and Shanghai for the time being,” said Apple spokeswoman Carolyn Wu. Other Apple stores in China opened today and Ms Wu said the iPhone 4S quickly sold out. She said the phone will still be sold in China through Apple’s online store, its local carrier China Unicom and retailers which are authorised resellers. Ms Wu declined to comment on what Apple might know about touts buying iPhones for resale. China is Apple’s fastest-growing market and “an area of enormous opportunity”, chief executive Tim Cook said in October. He said quarterly sales were up nearly four times over a year earlier and accounted for one-sixth of Apple’s global sales. Apple’s iPhones are hugely popular in China and stores are mobbed for the release of new products. iPhones are manufactured in China by an Apple contractor but new models are released in other countries first. That has helped to fuel a thriving “grey market” in China for phones smuggled in from Hong Kong and other markets. If you are located in the good old USA…..there is no need to throw eggs….just go online and have it delivered to your home. Buy it from Walmart and save some money…. This is the most complete and comprehensive Star Wars package ever. 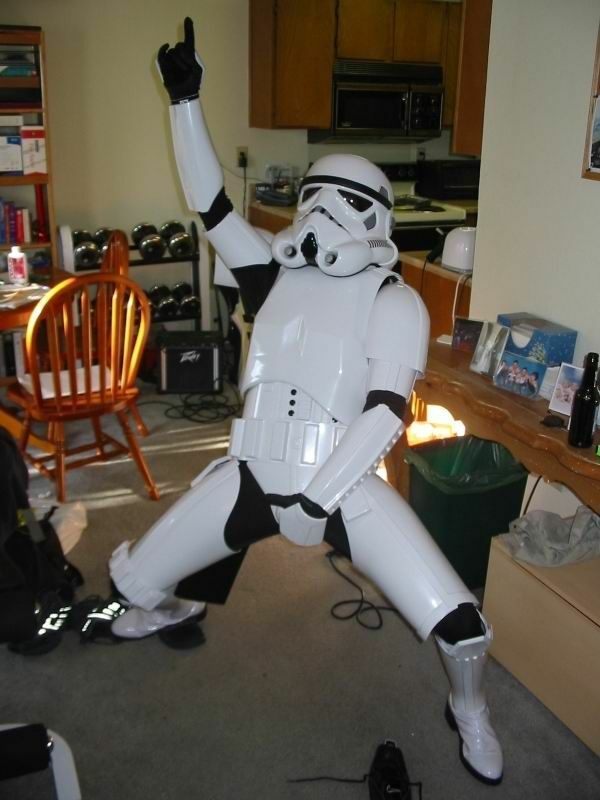 For you die-hard Star Wars Fans this contains so much more than the movies. The “Lost Anchorhead Footage” and many other never before seen clips are there too. It will take a long time to go through everything here but I just received my package and tore it open to see if it had the extra bonus material and couldn’t get enough of it. Can’t wait to watch the movies (for the hundredth time) but want to go though and see these extra scenes first. I was going to pick it up from Amazon but decided on buying it from Walmart.com ’cause it was slightly cheaper. Article from CBS News website. It won’t be long now before many of us turn our attention from Thanksgiving feasting to Black Friday buying, on the day after. And on “The Early Show” Wednesday, Brad Wilson, founder and editor in chief of Brad’sDeals.com and BlackFriday2010.com gave viewers a head-start on finding the best deals out there – sales worthy of setting your alarm to rush to! Wilson says timing is everything on Black Friday – such as knowing which stores open early and when. He told CBS News, “The deals are amazing, really rock-bottom this year, but most people are too busy to wade through dozens of 50-page circulars. We’ve done the work of highlighting the best deals for you, but knowing when stores open will be key. These super sales are only good while supplies last. Toys-R-Us opens at 10 p.m. on Thanksgiving, Kohl’s sales kick off at 3 a.m., and Sears and Target at 4 a.m. on Friday. Walmart’s Black Friday sales at 12:01 a.m. – with the exception of electronics which go on sale at 5 a.m. Plot your route from store-to-store based on store opening times, and since quantities are very limited, arrive before the doors open. The marketing war for your holiday shopping dollars is well under way. Target officially unveils its Black Friday deals online today (Nov. 24th), but the print circular won’t reach homes until Thanksgiving Day. Target will attract plenty of Black Friday attention with their $3 appliance deals including this Chefmate 2 Slice Toaster (which usually retails for $10 dollars). Read the fine print on deals this good. There is a supply and demand issue here and you will need to be at the head of the line to nab one of these items. And…bonus shopping tip – Target is also offering a $10 gift card for every $100 spent from 5 a.m. to noon on Friday. Zhu Zhu hamsters, which are interactive toy pets, each with their own set of over 40 sound effects, squeaks and chirps, are still one the top-selling toys for kids this Christmas. These were also the Winner of the 2010 Toy of the Year Award. If you haven’t seen these furry creatures, you may not know that they can be put in either of two play modes: “nurturing mode,” in which they coo and purr, or “adventure mode,” in which they explore their habitat and respond to various stimuli. They also have a sleep mode (if you get tired of all their buzzing around.) The most popular kids toys are almost never discounted this deep, but you can scoop up Zhu Zhu Pets (which typically sell for around $10.00,) for $4 a piece at Walmart starting at midnight on Nov 26, while supplies last. I usually steer jeweler shoppers to online sites where they don’t collect sales tax, shipping is free, and returns are extremely simple, but this deal beats any of that. The traditional jewelry store model is being challenged by deals like this…this 2-carat diamond bracelet which usually retails for $575 at Kohl’s, will go for $99 bucks during Kohl’s Early Bird hours (3AM – 1PM). That’s a savings of 82%. Just as they say in their ad, you can “stand out with sparkling style wearing this diamond bracelet.” It features multiple rows of diamonds on top of a sterling silver bracelet. This luggage, which usually retails for $200, may not be brand name, but it is just an amazing deal (at 75 percent off!) You’re going to get all 5 pieces for $50 bucks! This set probably won’t last you a lifetime, but it’s a steal. When you are talking about cashmere the price is usually in the hundreds, but the price of cashmere has actually come down. That said – it has not come down this far and this is a great deal. In fact, this sweater usually retails for $100.00, but has been on sale this week for $54.99. Kohl’s is undercutting its own price for Black Friday. This is an all time low for a 32″ HDTV – ever, anywhere! This was a special buy for Walmart (at $298) for Black Friday, but then they reduced it another 33 percent ($100 off). This is the perfect example of how the biggest retailers are using their purchasing power to undercut the competition on price. These will also go very fast. According to Walmart’s site “this 32 LCD HDTV delivers natural, vivid images for a superb viewing experience, and a virtual surround system provides great audio.” When you are talking about cashmere the price is usually in the hundreds, but the price of cashmere has actually come down. That said – it has not come down this far and this is a great deal. These cameras (which usually cost $171 on Amazon) are small, high quality, and easy to use. It comes with easy to use editing software for your computer. Just a great deal – usually not this cheap – especially without having to mess with a rebate. Plus – this is the newest model (3rd generation / 8 GB / 2 Hours), not an older model. You can shoot up to 2 hours of better-than-ever HD video on the even slimmer model. They’re really simple to use (just press the big red button to start and stop recording) and edit and share your videos with the FlipShare software. What bride and groom haven’t asked for this on their registry?! Here’s a chance to buy it for a rock bottom price. The price for the KitchenAid Classic Plus Stand Mixer (275 Watts, 10 speeds, 4.5 qt. bowl) is usually $259.99, but it will be $199.99 on Friday, BUT…if you shop early (3AM – 1PM) you can receive an additional 10 percent off and a $20 rebate – making the price $160! This is the kind of deal we specialize in finding all year round. A great sale of 38.4 percent off, coupled with a special 10 percent off and a coupon on top of it. Shopping bonus – You’ll $30 in Kohl’s Cash you’d collect by spending over $150. How does that work? Well for every $50 spent (in store or online) shoppers get $10 Kohl’s Cash back that can be used towards anything in the store on a future purchase. For example the Kohl’s Cash received on Black Friday would be available for use November 29 – December 6. You can’t immediately use the card. Sam’s Club has low prices every day, but is going even further on Black Friday. With all the competition in motion gaming coming to market around Christmas, the price of a Wii – especially the bundles with 2 controllers, 2 wheels, 2 nunchucks, 3 games, are coming way down. Don’t expect the new gaming systems to come at a discount for some time. This Wii bundle is usually $350 at Sam’s Club, but will be 15 percent off making it $299. (CNN) — Kenji Onozawa went to Best Buy at 4 a.m. on Black Friday last year searching for discounts on a Blu-ray player and a netbook. Supplies of those hot items ran out before he reached the front of the line, however, and he left the store, sleepy and disappointed, with only a “Lion King” DVD in hand. All told, he said, it was “possibly one of the most miserable experiences” he’d ever had. This year, Onozawa has given up real-world shopping. He plans to do all his gadget buying online. While Black Friday — the day after Thanksgiving in the United States — is one of the biggest retail shopping days of the year, tech-smart consumers are increasingly turning to the internet for the best gadget deals. Last year, 84 million people in the United States went online from mid-November to mid-December to shop for gift items, which was up 12 percent over the year before, according to comScore, a company that tracks online traffic. Furthermore, the growth in online purchases is expected to outpace that in brick-and-mortar stores this holiday season. Analysts are predicting 9 to 16 percent increases in online sales, compared to a 2.3 percent increase in real-world spending, as calculated by the National Retail Federation. Attribute part of the trend to practicality, since people like Onozawa can stay in their PJs to shop instead of throwing elbows in madhouse crowds. Online discounts “are as juicy or even more appealing than what some of the retailers are promising on Black Friday,” said Mike Gikas, a senior editor for electronics and technology at Consumer Reports, the nonprofit group. On the internet, particular days seem to have less importance than at retail stores. Wal-Mart, Amazon, Target and Best Buy are already offering online discounts on electronics that may match or beat Black Friday prices. Target.com, for example, is selling a Samsung HDTV for $50 less than Wal-Mart’s advertised Black Friday discount price of $500, said Dan de Grandpre, editor-in-chief at DealNews, a website that tracks product discounts. Other online deals may not surface until mid-December. Because retail stores have overstocked their supplies of TVs, merchandise shouldn’t run out and “the deals will get better, guaranteed, as you get closer to Christmas,” said Gikas. Some discounts may pop up online on Friday, in tandem with in-store deals. Apple, which isn’t known for discounting its high-end products, says it will have a one-day online sale at Apple.com on Friday. The ad on its website makes no mention of a companion sale in Apple retail stores. But experts say that shopping holiday is largely bunk. The internet tracker comScore said Cyber Monday never has been the biggest online shopping day of the year. That day typically comes on a Monday in December, said comScore’s senior director of industry analysis, Andrew Lipsman. Still, the Monday after Thanksgiving is a bigger day for online shopping than either Thanksgiving day — which has been talked about as the hot new day to shop online — and Black Friday. Last year, Americans spent almost $900 million at online retail stores on the Monday after Thanksgiving — compared with $595 million on Black Friday and $300 million on Thanksgiving Day, comScore said. For people shopping for technology gifts both online and at real stores, there are a number of apps and websites to help the search. Several websites, like DealNews, RetailMeNot and DealDump, aggregate online shopping deals in one place so consumers can find them. But a simple internet search for a specific product may be all you need to come up with a good price comparison, said Ramon Llamas, a senior research analyst at IDC, who recommends tech consumers avoid Black Friday entirely. Smartphone apps and social shopping sites also are empowering consumers in new ways. The apps RedLaser and ScanLife, for example, let users scan product barcodes in brick-and-mortar stores and then see a list of websites that are selling that exact item, often for less money or without sales tax, as Slate’s Farhad Manjoo points out. Consumers should also look for free shipping deals online. More than 40 percent of online transactions in April through June included free shipping, said Lipsman of comScore. Sites that don’t offer free shipping are also likely to lose consumers, he said. “It’s something consumers have come to expect,” he said. Onozawa, the Seattle shopper, is on the lookout for Microsoft’s Kinect gaming add-on, an HDTV and maybe an MP3 player this holiday shopping season. Instead of hunting around stores, he’s watching Twitter feeds and browsing websites in hopes that he’ll get the best deal. “I’m already shopping online,” he said, adding that it’s easier — and less terrifying — for him than bumping shoulders with the retail mob. Hey there! Have you checked out the brand new CmdStore.com? If you hadn’t already noticed, we’ve completely revamped our website and stremlined it so it’s more convenient. The buttons are bigger, the cart is easier to see as you load it up and the featured items will be changing more frequently, too, showcasing the newest and coolest of the toys we list. Even better, we’ve also added a brand new LIVE CHAT applet up at the top of the page. When it says ‘ONLINE’ (during our regular business hours), you can click on and chat live with a member of our staff who’s ready and waiting to answer any of your questions. Give it a shot any time you need some advice or answers about anything we offer! Enjoy the new site and happy shopping! Re-stock Alert! DC Universe Series 9 is BACK! Back by popular demand, Series 9 of the DC Universe collection from DC Direct has been re-stocked and is back on our shelves. So if you were waiting on your favourite member of the series 9 crew, your time has come. Wildcat, Green Arrow, Black Canary, Deadshot and The Flash are just a few of the figures in this collection of DC Heroes and Villains. Each toy comes with one piece of the massive Build-a-Figure. This time out, you can construct a terrifying rendering of the the toxic menace, Chemo. Doing so, of course, means that you will be joining the ranks of the most terrifying supervillains of all time, but as long as you’re prepared, we can supply you. The one exception to the re-stock is the comic version of DC’s MANTIS. But never fear! Though he hasn’t yet arrived, we’re expecting a new shipment next week!